Google Earth lets us see the world from our computer, with topographical maps and satellite images, which it has been doing for ten years. 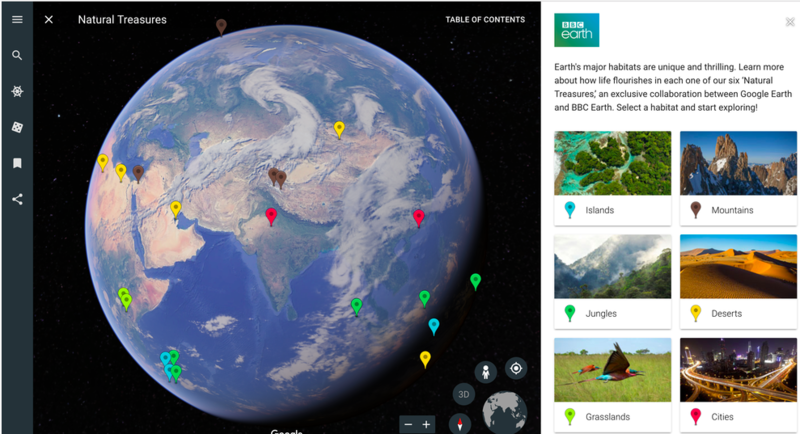 As a tool for exploration, Google Earth has been a useful addition to classrooms for taking students on a virtual journey to places they may never visit in reality. 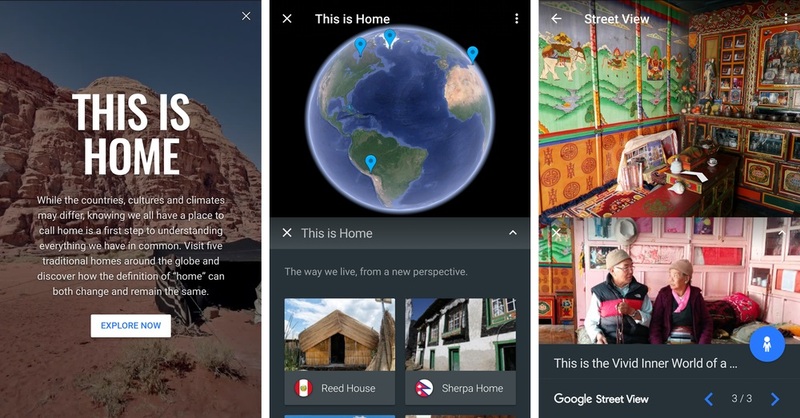 Google recently unveiled an updated version of Google Earth with a feature called Voyager, which is a showcase of guided tours, intended to curate your experience with the platform. It was created with the help of “some of the world’s leading storytellers, scientists and nonprofits,” Google says in its announcement of the launch. Some of the new features include the Voyager tours, about forty of which cover both broad and specific topics ranging from culture to geography to history. While observing a natural landscape or monument, a new feature called “knowledge cards” provide pop-ups with information about what you are viewing. With Google Earth’s sharing features, you can send links to what you are viewing right to Google Classroom, if your class is using it, to other social media sites, or to your email. A new 3D Button allows you to see any place from any angle, from which you can take a “postcard”-like a screenshot. This could be quite useful in a classroom activity, where a lesson involves finding places of relevance, or finding something specific to design or a landscape that fits the subject matter. A new “I’m feeling lucky” feature now includes a list of 20,000 intriguing and interesting places around the world, chosen at random. Google Earth's Voyager is currently available on the Chrome browser and on Android, but it will be available on iOS in the near future. You can look at habitats from around the world, including mountains, jungles, and their unique wildlife with Natural Treasures from BBC Earth. Jane Goodall hosts a tour in the Gombe National Park in Tanzania, where she talks about her team’s chimpanzee research and conservation efforts, another great resource for educators studying biology, anthropology, ecology, and more. Interested in learning about indigenous cultures and their imprint on the earth? Sesame Street is participating with its Girl Muppets Around the World which includes such cultures as the Mayans. This is Home is a feature of Voyager that allows you to journey into traditional homes from cultures around the world and will be regularly updated. Using Google Earth to investigate Earth’s structures, formations, and land masses is easy, as nearly all locations are surveyed, mapped, and can even be searched with coordinates. Certain themes feature unique geographic locations. Earth View is a Voyager tour where you can explore a collection of the most striking and enigmatic landscapes available in Google Earth. PBS Explorers offers a variety of Voyager tours for Google Earth, including Age of Encounter, which lets you follow six bold navigators as they open the globe to exploration and claim territory for European empires. Lost Civilizations from Above gives a bird's eye view of ruins and ancient structures that exist to this day. These themes feature historical information and images, and provide a virtual tour of where the history took place. Looking at architecture that is native to a certain city, or unique to a certain culture is made possible through Google Earth, where you can view structures in every style and form. Some voyager themes include Futuristic Architecture, “Leaning” Architecture, and Museums Around the World. At the ISTE (International Society for Technology in Education) conference, Google presented details about how it’s expanding its lineup of tours to include 10 new stories, specifically designed for educational use. Collaborators include National Geographic Society, PBS Education, HHMI Biointeractive, and Mission Blue. Google is also introducing lesson plans and other activities for teachers to help better guide their classroom use, so this platform will be receiving a lot of attention for its educational value.